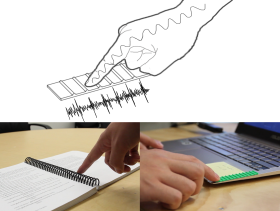 Vibrational signals that are generated when a finger is swept over an uneven surface can be reliably detected via low-cost sensors that are in proximity to the interaction surface. Such interactions provide an alternative to touchscreens by enabling always-available input. In this paper we demonstrate that Inertial Measurement Units (known as IMUs) embedded in many off-the-shelf smartwear are well suited for capturing vibrational signals generated by a user’s finger swipes, even when the IMU appears in a smartring or smartwatch. In comparison to acoustic based approaches for capturing vibrational signals, IMUs are sensitive to a vast number of factors, both, in terms of the surface and swipe properties, when the interaction is carried out. We contribute by examining the impact of these surface and swipe properties, including surface or bump height and density, surface stability, sensor location, swipe style, and swipe direction. Based on our results, we present a number of usage scenarios to demonstrate how this approach can be used to provide always-available input for digital interactions.